Oligosaccharides symbolize second class of carbohydrates that comprises of few (2 to 10) monosaccharide units or residues attached by characteristics linkages known as glycosidic bonds. Oligosaccharides can be diasaccharides when they have only two units of monosaccharides, trisaccharides when they have three units of simple sugars, tetrasaccharides when they have four units of simple sugars, pentasaccharides, hexassacharides or heptasaccharides. The most significant Oligosaccharides are diasaccharides that have two units of simple sugars. All common Oligosaccharides contain names ending with suffix - ose. In cells, many Oligosaccharides containing three or more units don't occur as free entities but are attached to non-sugar molecules (lipids or protein) in glycocojugates. Oligosaccharides are mainly involved in two different kinds of linkages O -glycosidic linkage and N-Glycosidic linkage. O-glycosidic linkage is more common in joining monosaccharides unit together while N-glycosidic linkage generally links Oligosaccharides with other glycoconjugates such as protein and nucleic acid. O-glycosidic bonds joining monosaccharide units in Oligosaccharides can either be α or β configuration. These configurations rely on position of-OH group of anomeric carbon atom involved in linkage. When- OH group from anomeric carbon atom involved in glycosidic linkage is below plane, then it is known as alpha-O-glycosidic linkage and when it is above plane it is known as beta - Oglycosidic linkage. While writing name of Oligosaccharides, it is significant to specify two carbon atoms joined by glycosidic linkage in parentheses, with arrow connecting two numbers for e.g. (1 4) shows that C - 1 of first named sugar residue is joined to C - 4 of the second. Various kinds of diasaccharides do exist and differences in the diasaccharides are based on kind of monosaccharides units contained in them. Oligosaccharides are carbohydrates classified by simple sugars they have. This kind of saccharide polymer is situated in amino acid side chains often found within vegetables ranging from onions to artichokes and jicama. They are classified by their sweet taste and exclusive mouth feel. These carbohydrates are the source of controversy in nutritional community as they cause both good and bad reactions within human digestive system. 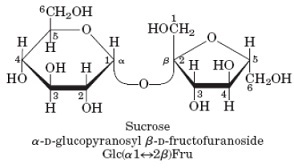 Maltose links two glucose units by α(1→4) glycosidic linkage, lactose (milk sugar) involves glucose and galactose bonded by a β1-4 glycosidic linkage, and sucrose (common table sugar) comprises of glucose and fructose joined by the glycosidic bond between carbon atom 1 of glucose unit and carbon atom 2 of fructose unit. Lactose has D - galactose and D - glucose units. Lactose happens naturally only in milk. Anomeric carbon of glucose is available for oxidation and therefore lactose is the reducing disaccharide. It is abbreviated as Gal (b1 - 4) Glc. Table sugar is sucrose and is diasaccharides of glucose and fructose. It is created by plants but not by higher animals. On the contrary to maltose and lactose, sucrose has no free anomeric carbon atom. Anomeric units of both diasaccharides are involved in glycosidic linkage. Sucrose is thus not reducing sugar. In abbreviated nomenclature for sucrose, double headed arrows in parenthesis are utilized instead of single headed arrow, as in lactose and maltose, this is only to point to that it is 2 anomeric carbons which are involved in glycosidic bond. 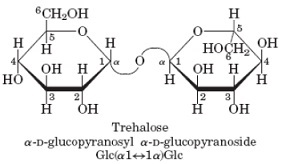 Trehalose, Glc (α1↔1α) Glc is diasaccharide having two glucose units joined by alpha 1 -1 glycosidic bond. Similar to sucrose, trehalose is non reducing diasaccharide (sugar). It is main constituent of circulating fluid (heamolymph) in insects where it serves in energy storage. Oligosaccharides can be hydrolyzed through acids or other hydrolytic enzymes to their monomeric units. Few Oligosaccharides can suffer mutarotation as they have reducing properties e.g. lactose. Few Oligosaccharides like maltose are reducing sugars whereas some are not e.g. sucrose.